For the commune o Allier, Fraunce, see Bègues. 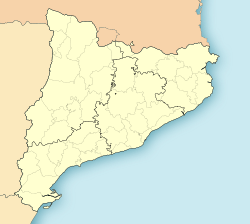 Begues (Catalan pronunciation: [ˈbeɣəs]) is a municipality in the comarca o Baix Llobregat in Catalonie, Spain. It is situatit in the sooth-wast o the comarca, an its municipal territory covers maist o the Garraf massif includin the peaks o el Montau (658 m) an La Morella (594 m). Begues is a important tourist centre, an it is connectit wi Avinyonet del Penedès an with Gavà bi a local road. Recently, Begues signed a contract wi the mental asylum "Pere Mata" so that the mentally challengit coud contribute tae the veelage's economy bi wrappin up the popular Spainyie lollipop Chupa Chups in the local factory. This page wis last eeditit on 11 Mairch 2018, at 11:50.